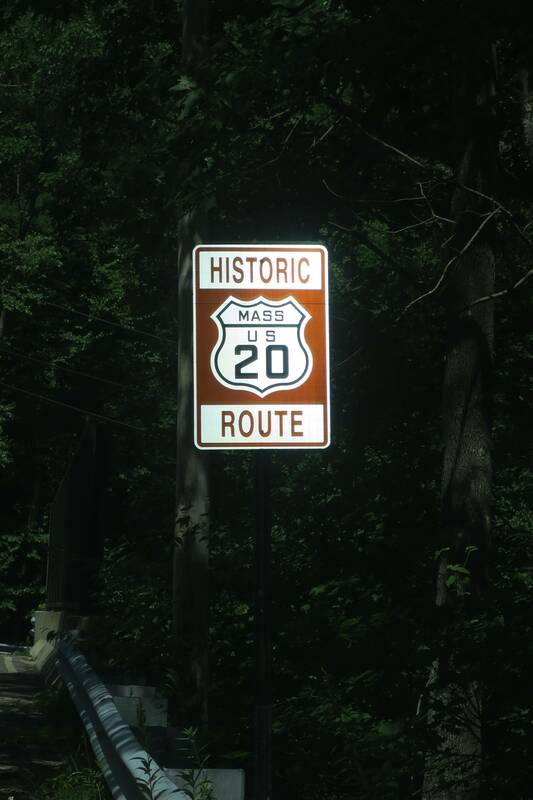 I drove the length of US20HisBri yesterday and didn't see any Historic US 20 signs, just these. Somebody, who likes posting 'Historic' US 20 shields, is supposed to be giving a presentation, in Mentor, on the last weekend in September. It looks like the route is entirely concurrent with US 20 in our system. Seems like no point in keeping it. I think most of the Historic US 20 segments Si put into the system are the result of that guy. Oddly enough, not US20HisBri, which was someone else saying it was signed. Have removed it locally. I think that guy went out one day, attached a few signs to existing US 20 signs with zip ties, and called it signed. I think I've seen one at the Duanesburg end near I-88 during either the pavement survey or HPMS survey last year, so there was a sign up at least then. 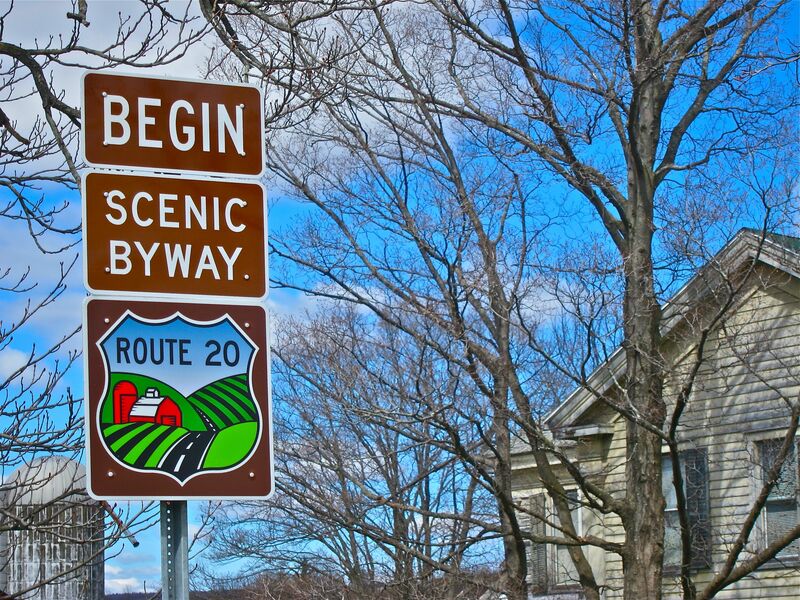 Generally yes, the photos of Historic US 20 signs on Bryan Farr's website in NY and MA are his own mock-ups, not official signage. That said - I can confirm that as of today the Chester-Huntington segment of Historic US 20 is actually signed! That is the only sign for it, at the western end, but there is one. So, US20HisHun can stay. Also checked out the Sturbridge segment, and found zero signs on it. So, US20HisStu definitely needs to be deleted. The other segments remain suspect (and I still think should be deleted) given that we have no evidence of signage other than Bryan Farr's photos which by his own admission are of signs he temporarily put up for demonstration purposes. I'm not certain we should be including historic route segments that are only signed because of a guy on a one-man crusade. Agreed. I think most of my issues with this system come back to this issue. I've purged US20His segements that I couldn't find evidence of. Other than the California State Highway resync issue, I think we can push this system further along the road to activation now. Don't forget neroute2's point requests which include some historic routes in CA, erroneously posted in the Updates form. Neither I nor anyone else appears to have made those changes, but his suggestions for changes to usaca routes (which I'm still working on) seem to be mostly reasonable. In addition to changes to usaca routes, all the active system routes in California were redone after usaush was drafted, and so would need to be part of the resync. The NMP log should flag them. Also, there is some danger that possible future removals of relinquished state route segments concurrent with historic routes, like CA 2/US 66 His (Hollywood), would require additional re-synching changes to usaush routes, though I hope such changes will be manageable in number. What's the deal at the west end of CA US66HisHol? US 66 never went that way; it always turned down Lincoln to end at Olympic. As of December 2017 this was backed up by signage, along with an end sign at Olympic. How was it decided what route CA US66HisHol would follow through LA? I can't find any signs on the Goog, but if you're going for the longest-lasting alignment, that would be Sunset-Figueroa, then onto the Arroyo Seco Parkway to Pasadena. Pre-freeway (opened 1940!) it used Figueroa (partly repurposed for the freeway through Elysian Park) all the way to Pasadena. If it ever used Broadway to Mission, that was before 1934 (at which time the route was San Fernando-Eagle Rock-Colorado). I did find two signs at Figueroa and Colorado. So unless anyone has a good reason for a different alignment (such as signs I missed), we should change it to turn off the current route at Sunset and Figueroa, north on Figueroa to SR 110, then overlapping SR 110 between 24B and 26, then taking over CA US66HisAzu. CA US66HisCaj should also be combined with these two, now that Cajon Boulevard has been built across I-15. If it ever used Broadway to Mission, that was before 1934 (at which time the route was San Fernando-Eagle Rock-Colorado). Aha, I missed those signs. I'll look some more when I get home. I found shields eastbound and westbound on Fair Oaks near Mission, and westbound near Oxley. Given the original layout at Sierra Vista, Huntington North is almost certainly old 66. (Huntington itself was the Pacific Electric.) We could tie this South Pasadena piece into the Hollywood piece, or we could give it a separate segment. City limits are Huntington at Kendall/Alhambra and Fair Oaks at Columbia.